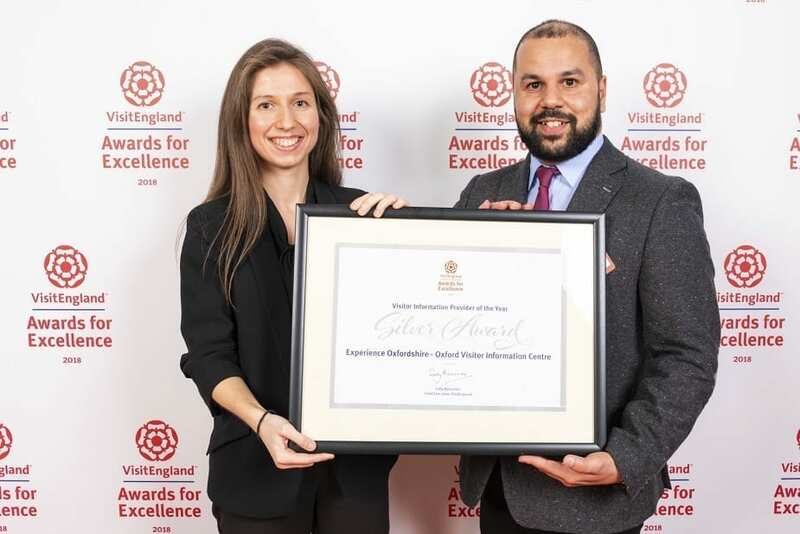 Experience Oxfordshire’s Oxford Visitor Information Centre won the Silver category at the prestigious VisitEngland Awards for Excellence 2018 Ceremony. Celebrating excellence across the industry, the Oxford Visitor Information Centre was presented with their award during a ceremony at the Bath Assembly Rooms on 23 April 2018. Oxford Visitor Information Centre received their award from Suzanne Bond, VisitEngland Advisory Board Member. “We are very proud of our services, and to have won the Silver award in the national competition. All the team work hard to provide service at the highest level, and it shows it’s working! We will continue to help Oxford’s many visitors experience all that Oxfordshire has to offer. We enjoyed the wonderful award ceremony on Monday, and it was inspiring to be in the room with the best businesses in the tourism sector in England”. “We’re delighted with the award and it complements other awards that the Oxford Visitor Information Centre has received over the past few years for excellent customer service. Visitor Information Centres are still an important part of the visitor experience, and therefore we have continued to invest in providing this service for visitors to the County”. “The standard of the hundreds of applications we received this year was extremely high and that’s why Oxford Visitor Information Centre’s accolade is a testament to their excellent work. “These awards shine a spotlight on our fantastic tourism industry, with the winners showcasing the quality, innovation and excellence on offer throughout England and I warmly congratulate them on their impressive contribution to the tourism industry”. Image credit from left to right: Yulia Agababova, Customer Service Assistant and Kamil Paneque, Customer Services Manager. Oxford’s Visitor Information Centre is based on historic Broad Street and welcomes over nearly half a million visitors through its doors each year from both domestic and international markets. It provides many services for visitors, including information provision, left luggage, tickets sales for attractions, tours and events, accommodation booking, and sale of maps, guidebooks, and gifts. The centre also provides services for conference visitors to Oxford and offers training on information provision to Oxfordshire businesses. Experience Oxfordshire is the Destination Management Organisation (DMO) for Oxfordshire. We are a not-for-profit partnership organisation committed to the promotion, management, and development of Oxfordshire as a great destination to live, work, visit and do business. 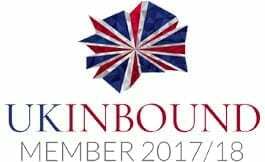 We have a growing partnership network of businesses spanning all parts of the visitor economy, and through effective collaboration, we are all working to ensure Oxfordshire becomes a leading destination for tourism, culture and business. The VisitEngland Awards for Excellence 2018 celebrate the best of English tourism. They promote high standards, helping to ensure England’s place as a world-class destination. www.visitenglandawards.org. In addition to the 18 categories are the special awards for Tourism Superstar, Travel Article of the Year and Outstanding Contribution to Tourism. The Travel Article of the Year recognises the important role of travel writers, broadcasters and bloggers in raising the profile of tourism in England and bringing to life the diverse range of holiday opportunities and tourism experiences across the country. The category was open to articles that have been published on England travel in a UK magazine, newspaper, online or on a blog channel in 2017, whether an England series, a destination feature or a round-up. The Outstanding Contribution to Tourism award is given every year by the VisitEngland Advisory Board to an individual or institution that has contributed something special and unique to tourism in England. Through their work during the previous year, recipients of this award have highlighted tourism’s contribution and value to our nation’s economy, employment, environment and quality of life.